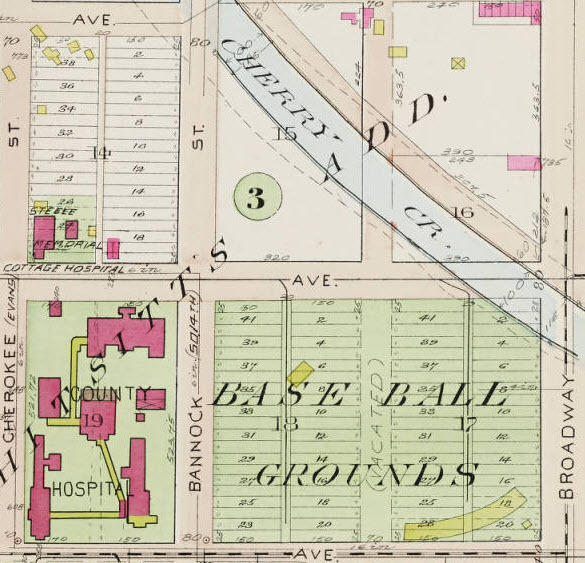 Broadway Park, at the intersection of 6th Avenue and the Cherry Creek, the most southwesterly corner of today’s La Alma Lincoln Park neighborhood, was the original home field of the Denver Bears. The prominent field also hosted the first decade of the Denver Post Tournament, which grew to a be a premier national baseball event. As with many of the stories I have uncovered for Across the Creek, this one started with an image, then a random reference, until a more complete picture of an earlier time came into focus. I ultimately discovered that after years of struggling to find a home field for a profitable baseball team for Denver, our neighborhood helped make that dream a reality for a time. Broadway Park served Denver’s “gods of sport” for about thirty years, before falling into disrepair and disuse. In the end, the lot was divided and sold off around 1926, and by today, is mostly absorbed by Denver Health and the Towne Place Suites. “The summer of 1913 exploded with Baseball Benefits. The Neighborhood House nine bravely took on other teams of the city such as East Denver, Elitch’s, and Sacred Heart. Society women served as usherettes. Musical programs were given before the games and during the intermission. Games were played in Broadway Park and a great time was had by all!! !” (Neighborhood House Scrapbooks). Then, when I was collecting images for the Lost Landmarks Gallery and researching the Denver Circle RR post, the story really started coming together. 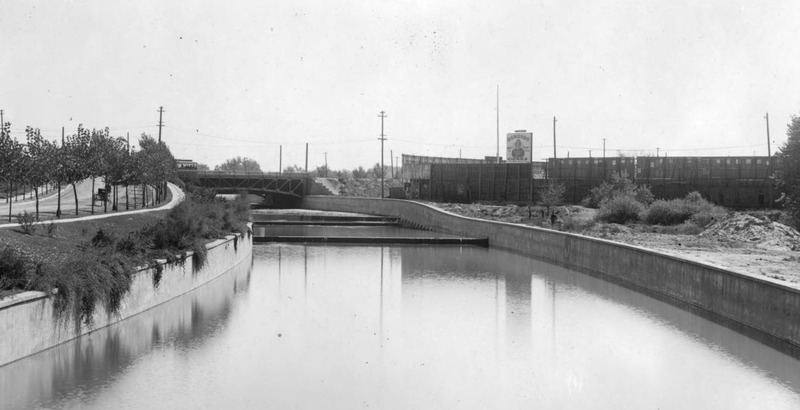 First, it was an image of our neighborhood border at Cherry Creek that included an old ballpark. Jackpot! Our amazing Denver Public Library’s Western History and Genealogy Collection offered a little more info with the caption, “View of Cherry Creek and Speer Boulevard in Denver, Colorado; shows spillways, concrete flood control walls, Union Park baseball field, and a Denver Tramway Corporation streetcar on the 7th (Seventh) Avenue bridge. 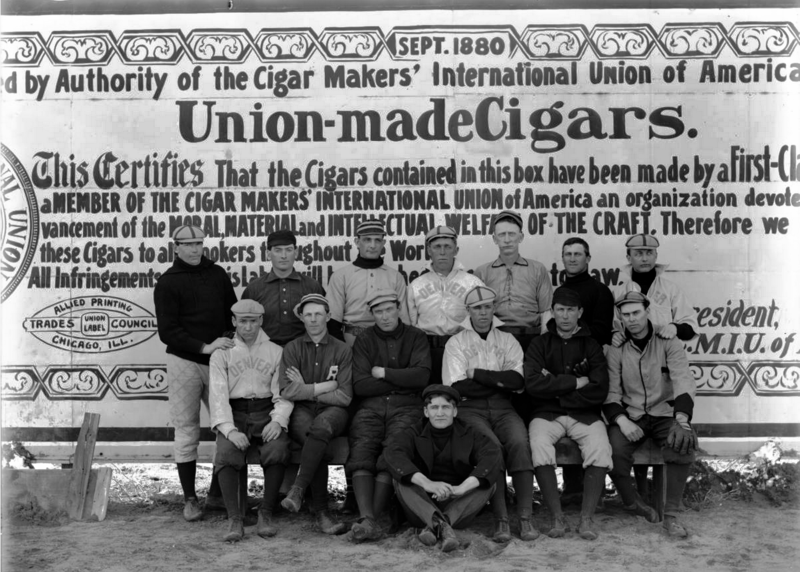 “While Union-made Cigars were evidently a sponsor, the field was most commonly known as “Broadway Park,” with no other uses of “Union Park” found. 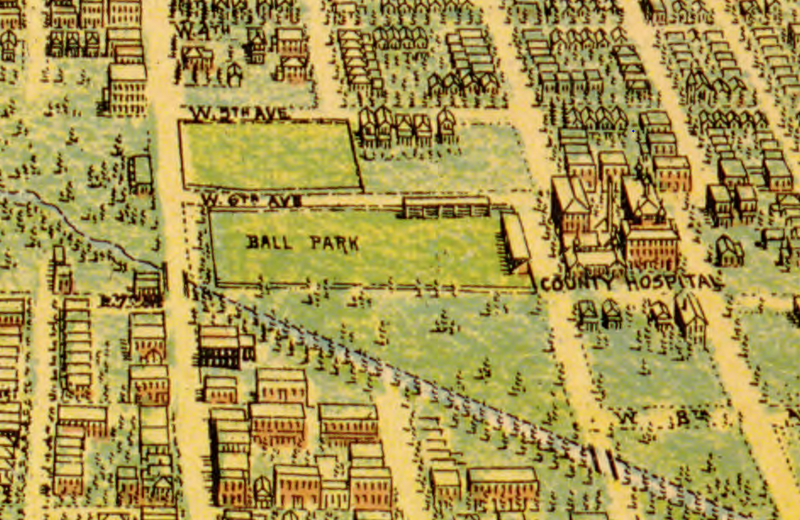 I saw it referenced frequently as Broadway Park II, because the original Broadway Park was at Colfax, which itself had to be reconstructed once after a fire. Pictures from and captions describing “Merchants Park“ on South Broadway helped to confuse the story a bit, too. In it’s lifetime, increased traffic around 6th, Broadway, and Speer lead to a reconfiguration of Broadway Park II as well. When Denver was first taking shape in 1860, the game of “base ball” was gaining in popularity in the East. But, with the survival of the settlement uncertain and the Civil War dawning, it would take Denver about twenty years to successfully organize a professional team of its own. 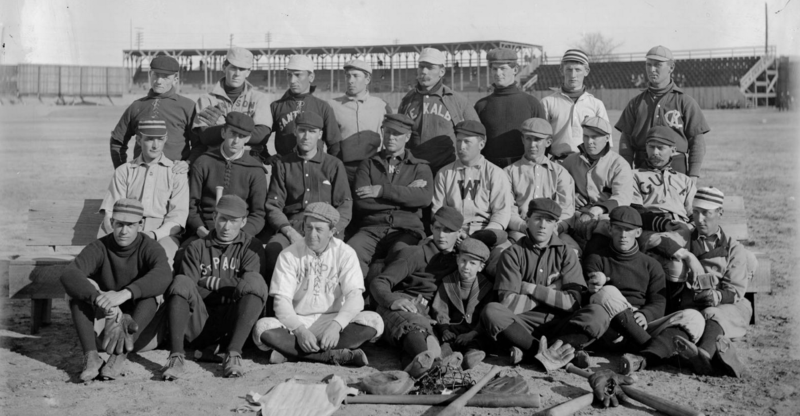 Sandlot games were very likely played from the start whenever enough men were assembled, however records of the first organized play began with Denver’s “better” set. With significant emphasis placed on a player’s character and social stature, 1862’s Colorado Baseball Club was a team with aristocratic airs. After several years of kicking about in the dust and heat, and an embarrassing defeat in 1867, Denver’s upper classes began to lose interest in playing ball themselves. Subsequent efforts to organize a gentlemanly league here required the inclusion of less “socially-active” participants to make things more interesting. 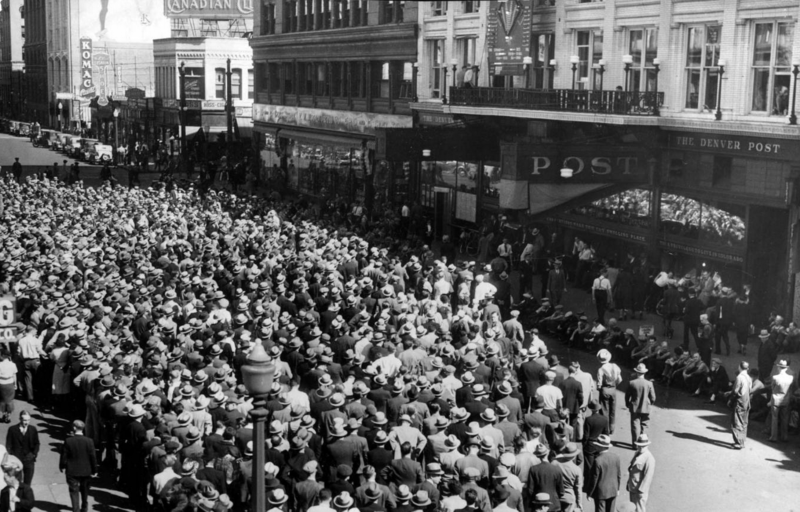 Having seen the game elevated in the East, many boosters and businessmen saw success competing in “America’s pastime” as an opportunity to raise Denver’s prestige nationally. It is well documented that many of Denver’s early residents generally preferred drinking, gambling, and prostitutes for diversion, and profitable baseball only began when the “sporting” elements took interest. Denver’s boom in population that followed the arrival of the railroads greatly expanded our pool of talent in the ’70’s and games became a little more competitive. The city had caught baseball fever and many merchants and neighborhood groups sponsored amateur clubs. But, our isolation from other teams and lack of a permanent venue were obstacles to early promotion to the national stage. At least Denver would achieve a reputation for producing talented players for other major league teams. In 1879, the “Denver Browns” became our first “professional” team when it competed in a series of games against Salt Lake City. Next, they represented us against the Colorado Red Springs and Leadville Blues in a 1882 three-team Colorado League. In 1883, prior to becoming Mayor, Wolfe Londoner began the Denver Baseball and Athletic Association, which held games at 32nd and Larimer Street, a short ride out of town on the horse car line. That field hosted teams from the region and served a number of local competitors. The “Athletics,” the “Denvers,” and the Rocky Mountain League would offer the best baseball in town for the next few years. 1886 was a big year for Colorado baseball. 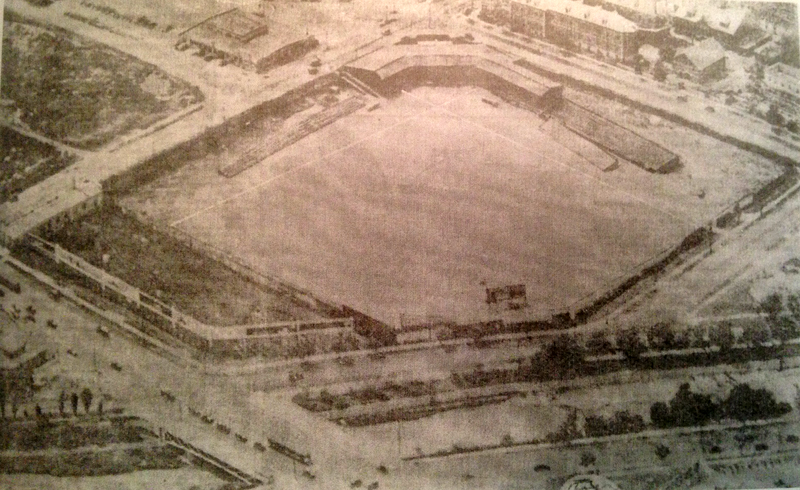 It marks the formation of and our entrance to the Western League, and the pennant victory for the “Denvers.” At Riverfront Park, we hosted “barn-storming” exposition games with big teams from across the plains: the Kansas City Cowboys (1886), the Philadelphia Phillies (1887) and the Chicago White Stockings (1888). Unfortunately,the big league experience was a little political, hardly profitable, and organizers did not always have the support of the papers to help promote the games. With the best players often getting picked up to play back East, the regional competitions didn’t necessarily entertain. Folks focused on the local leagues and often comical challenge matches such as the Police vs. Fire Dept and City Council vs. the County Courthouse lawyers. The league would experience a few periods of disorganization, but interest in the game survived. Professional ball repeatedly tried to reorganize itself and Denver emerged as the “Colts” and/or the “Trojans” in 1889. The season was most remarkable for games played at the first Broadway Park at Colfax. Among the players on the 1886 “Denvers” team was George “White Wings “Tebeau. He was known for his speed, grace, and well-groomed appearance. As team owner, his his reputation for thrift prompted a columnist to write that he was so cheap ” that he squeezed pennies until the Indian [cried] in pain.” He was also called a “father of Denver baseball,” and more significant for La Alma Lincoln Park, he brought professional minor league baseball to Broadway Park II in 1900. The arena was actually first built for an Association of American Wheelmen in 1893, and also hosted many bicycle races, college football, coursing, and other local athletic demonstrations. 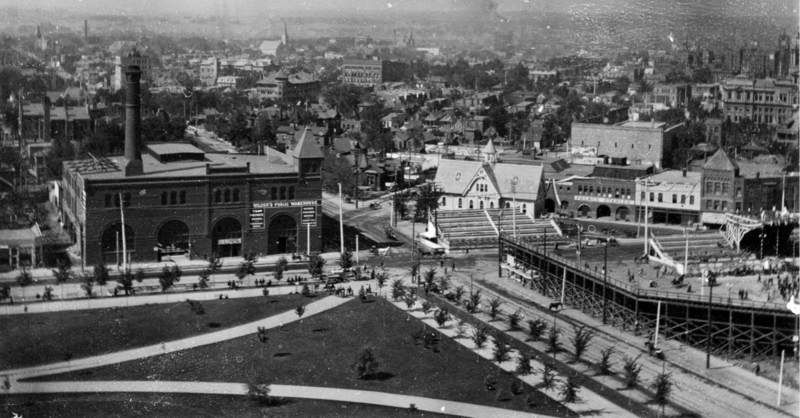 The park was centrally located and connected to the city by nearby Denver Circle trains, and then the Tramway Co. trolleys.Tebeau’s determination to see professional baseball in Denver and his purchase of Broadway Park would make it Denver’s own “field of dreams” for the first decades of the twentieth century. 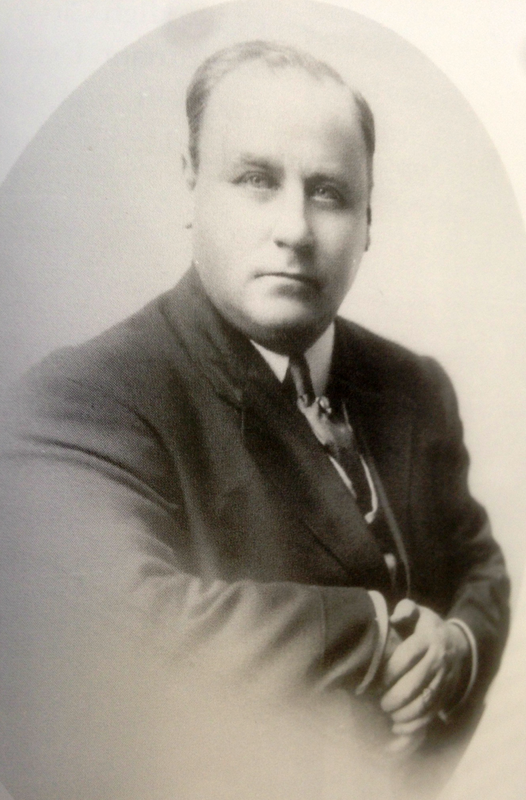 Tebeau was a baseball veteran that always believed that there was market here for the game, but knew his customers would only pay to watch quality players. He scouted hard for talent and kept payroll down by paying younger players less than veterans demanded. After an early fire at his park, he saw opportunity to improve business with a remodel, adding box seats for families with individual chairs. He fostered a “big league” atmosphere by adding a player clubhouse equipped with showers. 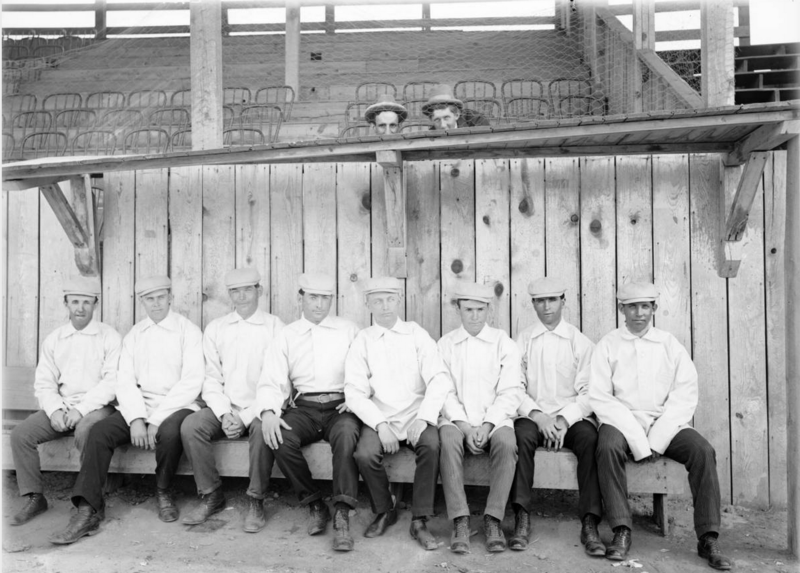 Admission prices were initially set at forty cents for general admission and sixty-five for the shaded grandstand seating, but were adjusted to 30 and 50 cents when attendance dropped below 1000 after the first few games. 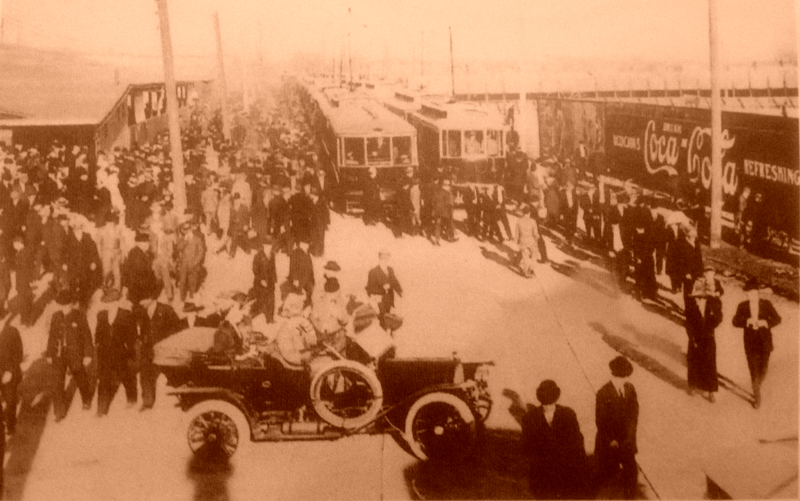 By the time the team was racing toward the Western League Championship pennant, crowds at Broadway Park reached about 4000 spectators. Fans enjoy the School Baseball Series at Broadway Park II. From Denver Municipal Facts 1909 June 19 p12. Courtesy DPL Western History Collection C352.078883 D4373mu. Tebeau’s winning 1900 team was actually called the “Skyscrapers” and/or “Roughriders.” It wasn’t until 1901, after he sold the team for the first time, was it referred to as the “Grizzlies” and/or “Cubs.” That year marks the beginning of President Roosevelt’s administration, and the team was also written up as the “Teddy Bears.” The names “Grizzlies” and “Bears” were used almost interchangeably for the team often connected to Tebeau, and always with the Western League, until going into hibernation in 1917. 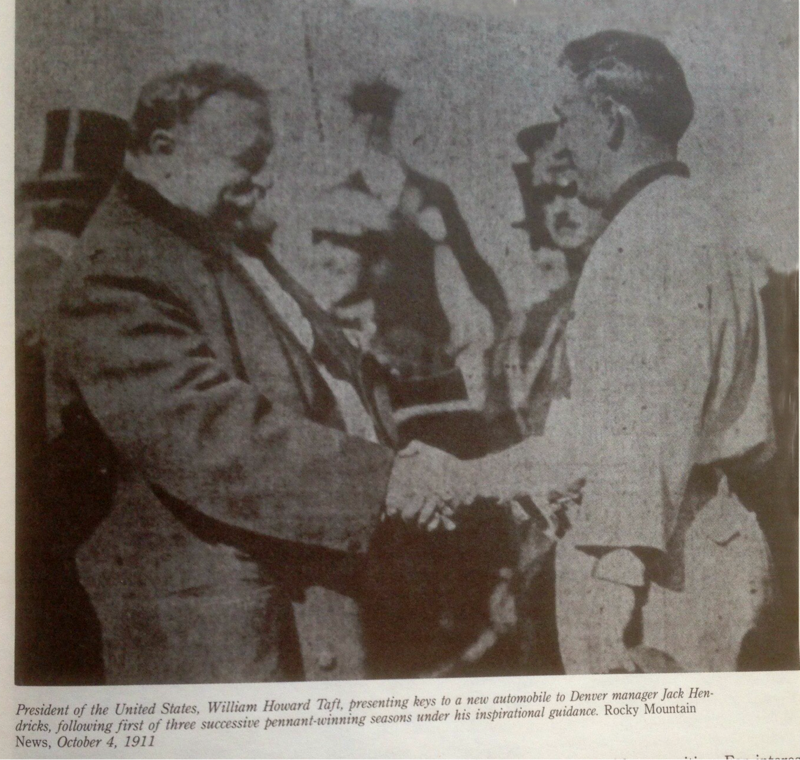 It must be noted that in 1911, President Taft helped honor the team at Broadway Park for the first of three consecutive pennant wins under manager Jack Hendricks. 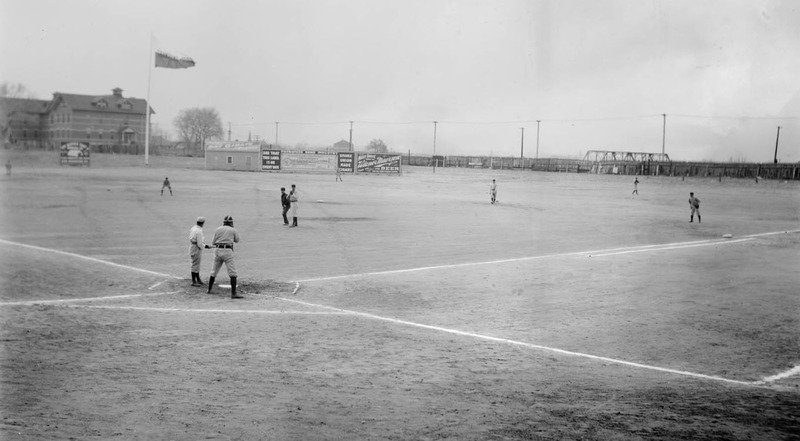 Starting in 1915, the Denver Post Tournament was hosted by Broadway Park for 10 of the first 11 years in existence. The tournament began as a local, ten team exposition, and grew to be known as “The Little World Series” by its final year in 1947. The full history of Denver’s struggle to establish viable teams in the West is filled with player poaching, blacklisting, and crippling disorganization. 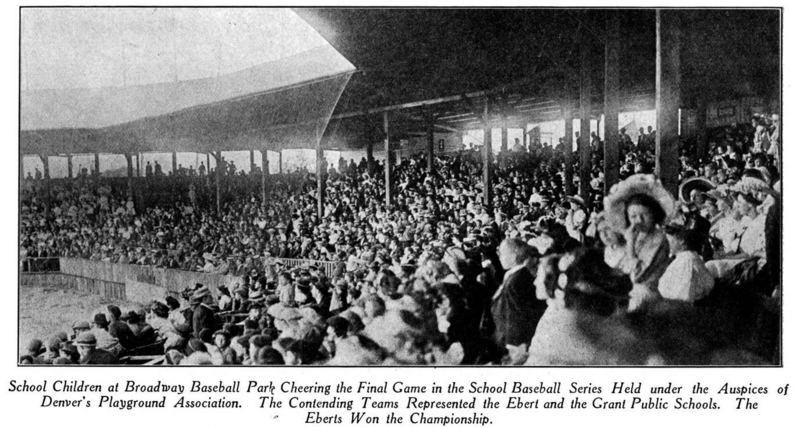 To keep people in seats, Tebeau invited the locally sponsored and semi-pro teams to bat it out in the park when the Bears weren’t playing. He always knew that fans would pay for quality baseball, and he had a knack for finding it. He had his hand in some part of the game until his death in 1923. The Tebeau estate was compelled to sell the lots off in 1926 and grand hopes of renovations to the prominent corner never really came to fruition. The Art Deco/Streamline inspired Hirschfeld Press building that was later incorporated into the Marriott hotel that exists today, wasn’t built until 1949. Foster, Mark S. The Denver Bears: From Sandlots to Sellouts, Pruett Pub. Co., Boulder, Colo. 1983. I purchased a picture for the frame at a second hand shop and when I removed the print, there was a cool picture of baseball team from Denver! In doing a quick google, I found that they were referred to as The Denver Bears. I’m uncertain of the year but the team members in picture have their names written on the back. Very old and faded and written in pencil it’s hard to clearly determine who they are. Can you suggest a route I can take to solve the mystery? 🙂 Please let me know whenever you can! Thanks! What a fun find! One of the Denver baseball books I have has a ton of team shots- probably more on the 5th floor of the Denver public library, as well as their image collection online.